Corstorphine Roofing and Building Ltd‘s most valuable asset is you the customer. We need your referrals. We appreciate the rewarding multiplier effect of our customers speaking highly of us, and recommending us to friends and associates. We also understand the damaging effect of not winning your satisfaction. It is to this end that all the workers of ours are trained, and trained continuously, in the principles of being thorough, paying attention to detail, doing business with integrity, and of being oriented to achieve our goals of earning your satisfaction and recommendation. 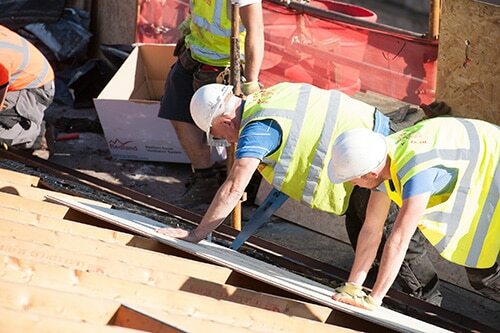 The goals of Corstorphine Roofing and Building Ltd and all of its workers are to provide you with excellence in service, roofing and construction. Our foremost interests to earn and maintain your optimum satisfaction. Our mission is excellence in roofing and construction. Our aim is to differentiate ourselves from our competitors by providing excellent workmanship and customer service. You will find our values of excellence, thoroughness and integrity a refreshing change from the standard fare of workmen you may have come across. The goals of Corstorphine Roofing and Building Ltd and all its workers are to provide you with excellence in service and roofing. Our foremost interest is to earn and maintain your optimum satisfaction. Our aim is to differentiate ourselves from our competitors by providing excellent workmanship and customer service. You will find our values of excellence, thoroughness and integrity a refreshing change from the standard fare of workmen you may have come across. Slate Roofing, Metal Roofing, Flat Roofing, Shake Roofing, Shingle Roofing, Tile Roofing, Siding, Gutters, Leaders, Soffits, and much more. Please inquire about any of your building needs! All personnel have strong work ethics and only the best are hired. Our workmen and technicians are trained in the use of proper methods and techniques, and the importance of paying attention to detail. Management is demanding – insistent on the highest standards in all areas. Mediocrity is not accepted from anyone, both office and field staff. Corstorphine Roofing and Building Ltd has been selected by various large institutions to do their contracting work. Most have done stringent background checks on the company, with the respect to our integrity, quality of workmanship, financial stability, service, customer satisfaction and the way we hire our staff. 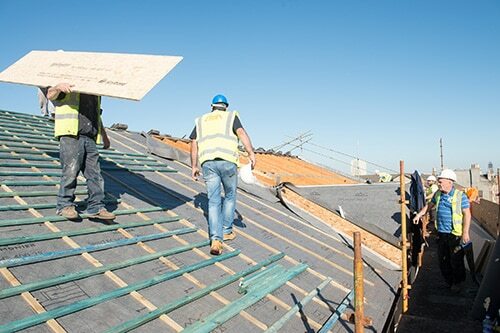 Corstorphine Roofing and Building Ltd is a licensed company with workers compensation and general liability protection. All personnel have strong work ethics and only the best are hired. Our workmen and technicians are trained in the use of proper methods and techniques, and the importance to paying attention to detail.